Our stunning new lazy susan design unites warm, rustic acacia wood and cool, sophisticated gray marble. Ideal for casual cocktails and snacks but chic enough to hold its own at an elegant dinner party. Better yet, leave it out for daily use and admire it every day. 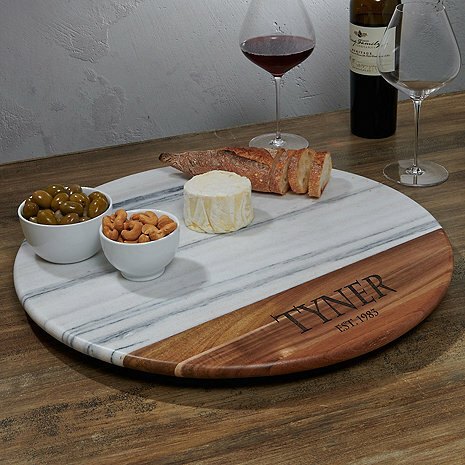 Marble is an ideal cheese board surface; it retains a cooler temperature, is resistant to germs and is easy to clean. For extended entertaining, chill the marble in the refrigerator for an hour before serving. Variations in the color and veining of the marble make each piece unique and one-of-a-kind. Please Note: This piece uses natural marble stone. Marble can have some naturally occurring vein lines and small imperfections. No two pieces will be exactly the same. Can I just have an initial and no year? Can I use upper & lower case? Example: DeCrescente - is how I would like the name to appear. What is the weight of this design? BEST ANSWER: 19 lbs per Wine Enthusiast Customer Service. I called. Great server for guests - Nicely made- heavy duty and convenient ! Beautiful presentation and large enough to be functional. Nice quality, bigger than I thought on purchase although will be very useful. Great, fast service. It's great for a charcuterie and it made my wife happy! We bought one first just to see the quality of the lazy Susan the quality is great so we bought four more for gifts. We also love that you can ingrave names on the wood part. Wine Enthusiast rocks! I have bought many items from here. Love, love, love!!!! We love the Lazy Susan. Only problem was that it took alot longer to ship to me than was indicated when I purchased it online. I bought this as a wedding present. It is absolutely gorgeous and very well-made. I would highly recommend this lazy Susan! Beautiful! It was for a gift and we were really please with the size and quality! Beautiful but check the turn first. The tray is beautiful but we did have to replace the turning table part (bearing plate was dented) upon delivery. Purchased as a gift and they loved it.